Self-propelled machines for wrapping stacked loads with protective LLDPE film, with one or multiple wrapping programs and various pre-stretch systems. The FROMM robot is a mobile, semi-automatic stretch wrapping machine. It is particularly suitable for customers who need to wrap a wide range of large pallets or for situations where stretch wrapping takes place in various locations. 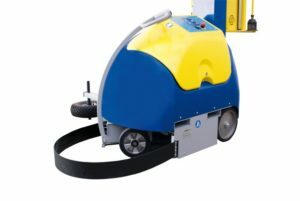 With the battery fully charged, it can wrap up to 180 Euro pallets. You would like to save more money? Check your costsavings via our calculation sheets. CLICK HERE. 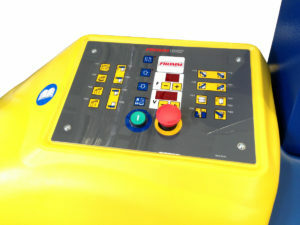 • machine functions adjustable on the easy to operate control panel.